Chukwudumeme Onwuamadike, suspected billionaire kidnapper better known as Evans, has asked a Lagos state high court to grant him bail. Evans is being tried on several counts of criminal charges bothering on alleged conspiracy, murder and kidnapping. At the resumed sitting of his trial on Friday, he also asked the court to give his case an accelerated hearing. His bail application was, however, opposed by the persecuting counsel who described it as an abuse of court process and an attempt to frustrate the trial. Titilayo Shitta-Bay, Lagos state director of public prosecutions, said the application of the accused, as well as the prayer to quash the charges brought against him was conflicting and confusing. After Evans pleaded “not guilty” on an amended two-count charge of conspiracy and kidnapping, the Lagos state government had filed fresh charges of conspiracy and attempted kidnap of Vincent Obianodo, chairman of The Young Shall Grow Motors. Evans was also alleged to have murdered a policeman attached to Obianodo. Dubbed the “most notorious kidnapper” in the country, he was arrested on June 10. Since his arrest, he has reportedly confessed to kidnapping numerous persons from whom he collects as much as “millions of dollars” in ransom. 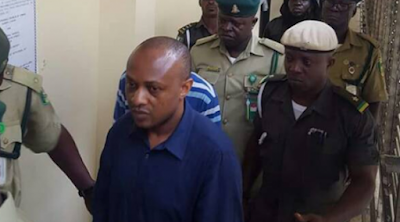 The police alleged that he committed murder during some of the kidnaps but his lawyer, Olukoya Ogungbeje, has maintained Evans is innocent.